'Angel Of Death' Among 29 Given Life Sentences Over Argentina's 'Dirty War' : The Two-Way Former naval officer Alfredo Astiz was convicted of kidnapping, torture and murder in a mass trial of defendants linked to a secret torture center during the country's 1976-1983 military dictatorship. 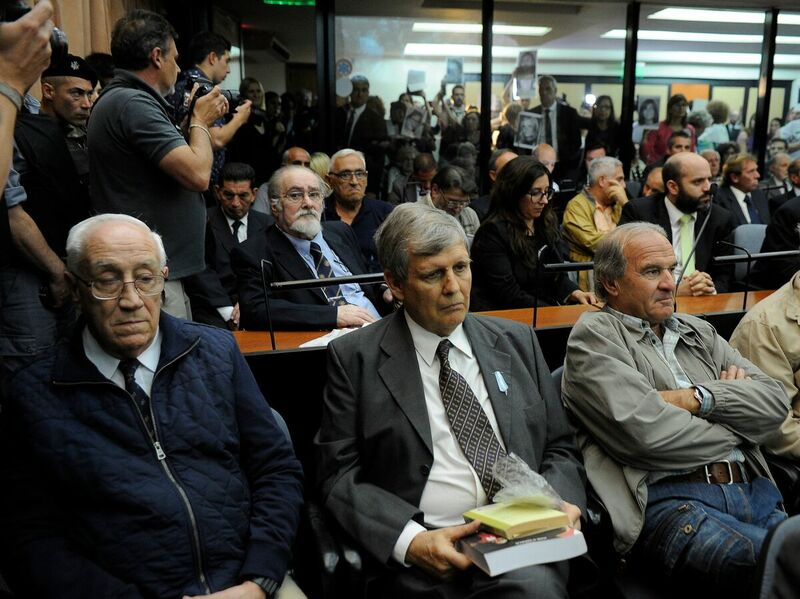 Front row, left to right: Jorge Eduardo Acosta, "The Tiger"; Alfredo Astiz, the "Angel of Death"; pilot Georges Mario Daniel Arru; and Carlos Octavio Capdevilla, known as "Tommy," are seen during their sentencing hearing Wednesday in Buenos Aires. Two former naval officers were among 29 people given life sentences Wednesday in Argentina for their involvement in human rights abuses carried out during the country's "Dirty War," a brutal period of military dictatorship from 1976-1983. Former Capts. Alfredo Astiz, known as the "Angel of Death," and Jorge Eduardo Acosta, aka "The Tiger," were given life sentences in the largest and longest trial of its kind in Argentina's history. It opened in 2012 and focused on crimes against 789 victims at the Naval Mechanics School, or ESMA, which was turned into a secret torture center. Astiz has refused to apologize for his crimes, saying during the trial that he would "never ask for forgiveness." Astiz was convicted on charges of kidnapping, torture, murder and stealing minors. As The Associated Press notes, his nickname "came from his cherubic looks and for his work delivering dissidents to the military junta as an undercover agent. He previously was convicted of kidnapping, torturing and murdering two French nuns and a journalist and was already serving a life sentence." "This is the first time a court in Argentina has issued a judgement against those involved so-called death flights, in which dissidents were drugged and tossed out of aircraft into the sea. "Victims included rights activists, relatives of others detained or killed, and two nuns. The court sentenced two former pilots to life for taking part in these flights." Some 30,000 people are believed to have been killed during the seven-year rule of the junta led by Gen. Jorge Rafael Videla, who led a bloodless coup to power in 1976, deposing President Isabel Martinez de Peron. Videla, who died in 2013, was tried and sentenced to life for his regime's abuses, but he and other junta officials were later pardoned. Astiz and Acosta were among the 29 who received life sentences. Nineteen others were sentenced to between eight years and 25 years, and six defendants were acquitted. The AP reports: "Hundreds of people outside the courtroom celebrated as sentences were read. Some held a large poster with photos of the 54 defendants with a letter 'P' for 'perpetua,' referring to life sentences, scribbled over the men's faces. Others held banners about the disappeared that read: 'Tell us where they are.' "